Next in the series on Joe's Beef Jerky is this Hot variety. See my previous review of their Regular variety. 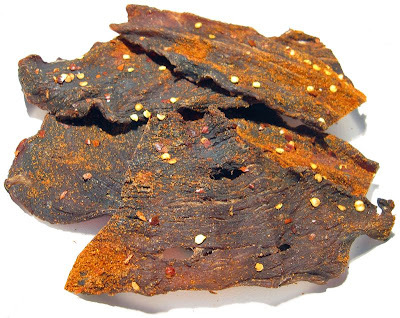 Joe's Beef Jerky is a brand of Joe's Beef Jerky, Inc., based out of Statesville, NC. It's a small, family run business in operation for several years, at least as far back as 1996. They make jerky in their own USDA inspected facility, and is a member of the "Goodness Grows in NC", where all of the ingredients must be grown in North Carolina. Joe's uses top round, cut to 3/16" thick, and marinated for 24 hours. They use no additives, preservatives, or nitrates. Beef, soy sauce, worcestershire sauce, liquid smoke, Texas Pete (peppers, vinegar, salt, xantham gum), salt, lemon pepper, garlic powder, onion powder, red pepper, cayenne pepper. The first thing I taste from the surface of these pieces is a light cayenne pepper flavor, followed by a light saltiness, and then a burn starting to build. I can also taste that same "saucy" flavor I noted in the Regular variety. Overall, the surface flavors have a strong intensity due to the hot spices. The chewing flavors start out with that saucy flavor in a slightly stronger intensity, perhaps giving the worcestershire and soy sauce enough definition to where I can recognize them. The chile pepper seasonings continue from the surface; they don't get any more intense in the chewing. For being labeled as a "Hot" variety, I'd say it holds up to that claim, though for me personally I see it more as "medium-hot" on my hot scale. But I think general audiences will certainly see this as hot. It's also varied, some pieces have a thick coating of red pepper seasoning and these get up to "hot" my hot scale. The pieces with a light coating, are just "medium". It actually does provide some chile pepper flavor, I think mostly through the cayenne seasoning. But not a lot of flavor, it's still struggling to compete against the "saucy" flavor. If anything, it's the burn that dominates, not necessarily the chile pepper flavor. And that "saucy" flavor, I believe, still provides the dominant flavor overall. I taste it more than any other flavor component. It's not really well defined as soy sauce and worcestershire, but I think there's enough definition in the chewing flavor that I can taste some resemblance of those two. It's more like watered down versions of soy sauce and worcestershire. Actually, I think the "saucy" flavor in this Hot variety is more flavorful than in the Regular variety. Perhaps the seasonings mix into that flavor better, or perhaps it's a slightly different marinade. But I want to say that it's a bit more intense. As for the saltiness, it seems to have a low intensity. Though the burn from the peppers can be easily mistaken for a salt burn. The natural meat flavors are hard to find in this, compared to Joe's Regular variety. The Regular variety had a light meat flavor, and when you factor in the spiciness of this Hot variety, it's as if there's no meat flavor at all. Overall, what you're going to get from this jerky is primarily that "saucy" flavor, much like with the Regular variety, though in a slightly more intense flavor. You'll get a light taste of cayenne pepper, but a good deal of peppery burn. These are slices of whole meat, sliced to a medium thickness, and in medium to large pieces. This is a dry jerky, but still very flexible, cracking with a fair amount of bending. Tearing pieces apart with my fingers is easy if torn with the grain, while chewing is moderately labored, quite chewy. The chewing texture starts out feeling stiff, with a good deal of rubbery resistance, but breaking down with several hard chews. Once it gets down to a soft mass, it has a steak-like chewing texture, but not totally. It still retains some rubbery resistance. I do see some significant streaks of fat on some pieces. In fact, of what fat I do see, I also see splotches of white bubbly residue, like foam that had dried but, collected only next to the fat. I also found a piece with thick streak of gristle that provided a nice crunchy rubbery feel. But I didn't encounter much stringy sinews. In terms of clean eating, it's not. The red pepper seasoning tends to pick up on my fingertips as I pinch down to tear these pieces apart. Looking at my lap, I have pepper seeds and seasoning all over. 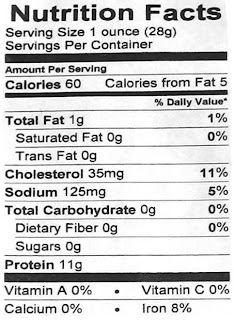 For general jerky snacking purposes, at the $2.06 price per ounce, this provides a fair value. I'm getting an average amount of snackability overall, with a stronger snackability on the flavor, but a lower snackability on the meat consistency. The $2.06 price per ounce is higher than the mass-market brands, but if you can overlook the chewy, tough texture, you'll find the flavor to be better than average. As a Hot variety, at the same $2.06 price per ounce, it's a good value. It's definitely hot, at least for general audiences. Even for someone who eats a lot of hot spicy foods, I find this providing a good deal of burn. If all you want is a hot jerky, you'll find this to be a worthy buy. 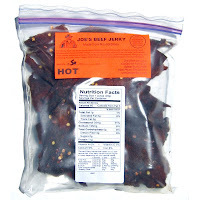 This Hot variety from Joe's Beef Jerky stands up well to its billing, providing a good deal of heat, though with only a light amount of chile pepper flavor. 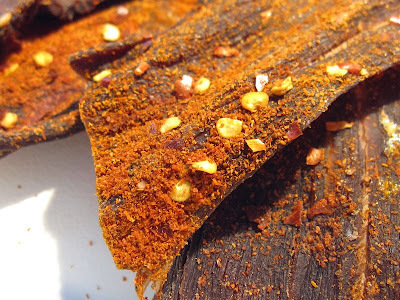 Otherwise, this jerky dishes out the same "saucy" flavor as with the Regular variety, with a low level of saltiness, and nary any meat flavors. Compared to the Regular variety, this offers that additional light chile pepper flavor, a lot of burn, and I think even a slightly more flavorful saucy flavor. Interestingly, this jerky is more flexible, though rubbery, whereas the Regular was more brittle and crumbly. While the flavor is perhaps good enough for me to rate as "good", the tough, chewy texture of this Hot variety made for some tiring eating, and caused me to take it down to "average". My recommended beer pairing for this, a smooth creamy stout.